Amazon Prime members were thrilled to learn the notoriously expensive organic grocery had been purchased by Amazon, thinking it meant prices at the food retailer would go down. 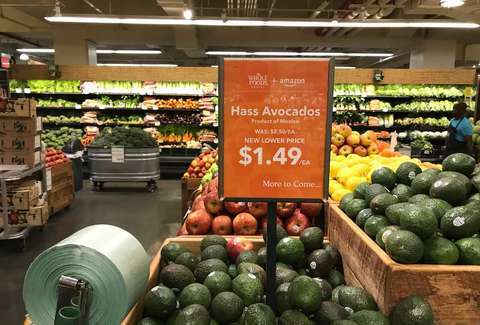 And while that certainly happened at first, it look like the opposite has happened, too: Prices have reportedly gone up on hundreds of Whole Foods items. Recent price increases have come as a result of inflation, according to a December Whole Foods internal email obtained by The Wall Street Journal. In the last year, brands like Clorox, Procter & Gamble, Nestle, and Unilever raised prices to cover the cost of ingredients. Whole Foods followed suit, raising prices on those products for consumers. The grocery store previously held contracts with other, unnamed vendors, which allowed it to sell those products for a lower price. Those contracts have since expired, however, and Whole Foods doesn’t intend to renew them. It has stopped selling many of the items, but those that will be restocked will be sold at a higher price. More than 550 products -- olives, cookies, ice cream, soap, crackers, and more -- are reportedly affected by the increases. Some prices have gone up only 10 cents, while others have increased by a few dollars. Per the WSJ’s report, the average price increase at Whole Foods is about 66 cents, which may seem insignificant, but could hurt your wallet depending on your shopping habits. Amazon purchased Whole Foods in 2017 for close to $14 billion. The takeover strategy was to make the retailer appear more approachable. At a leadership conference in 2018, however, Whole Foods CEO John Mackey admitted that “one reason the merger came about is Whole Foods was in a trap,” due to their pricing structure. Typically, Whole Foods prices aren’t considered accessible or affordable to middle-or-low-income families. The grocery store, which has 500 stores in the US, Canada, and the UK, is known for being expensive -- it’s even jokingly been called “Whole Paycheck.” Whole Foods has been sued on more than one occasion by consumers who felt they were overcharged ahead of the Amazon merger. It slashed prices on nearly 500 grocery items, including notoriously pricey items like salmon and avocados, two months after the deal was completed, but it’s done little to help its reputation. Whole Foods has also offered Amazon Prime members exclusive discounts on select items, and has rolled out smaller stores featuring its in-house, affordable line, 365. However, a leaked internal memo from January revealed Whole Foods will be abandoning the 365 store expansion, despite its popularity with lower-income shoppers looking for healthy, Earth-conscious options at attainable price points. The memos reveal that Whole Foods will likely never lose its reputation, and perhaps that was never part of the plan. People will continue shopping there. But there’s a good chance their grocery bills will be a bit higher now.